ALWAYS: Summers end. But this one will change them forever. Have you ever think of having second chances? Have you ever think of going back to the past where you could just repeat everything you did and probably change the future? I’m asking because I do. Like every single day, I wish I could live in the past for a while. I could say that this book is a great read. I had mixed emotions and the one that stays is the ending that made me cry. Reading this made me excited and frustrated at the same time because when I was reading the scene was getting to the climax then something will happen that you’ll get annoyed and sometimes I want to ask the author, why did you wrote that I was already excited (LOL). I had fun reading it. I liked how each and every one of the characters have their own side story. I like how each of them learned their mistakes and how they figured out their actions on how are they going to change their selves. I like how everyone just try to change the future but end up getting the opposite of what they wanted. Friendship that’s what they wanted to focus on here. Little things like friendship matters. I like how the wrote about the twists and turns from everyone’s life on this book. From Tali, to Luce to Zoe and to Joy. The four of them are best friends but two years passed Joy avoided the three of them for some unknown reason. Joy suddenly appeared and called them for a reunion but what happened is something extra ordinary. They all went back from two years ago, their day at the camp where every memories are good. Days passed and so many things happened and on their last day, is also the day they knew what really happened to Joy, or what was really the cause of her disappearance. The ending of the book broke me in to tears. Beautiful book. That is how I will describe the book in one word. It’s something that I will never forget because it makes me realize that second chances maybe a good thing or a bad one, but still I will take the risks though, going back one year or two years ago? Why not. And what caught my eye first thing is the cover. I wasn’t expecting something that deep kind of story when I saw the book cover, all I know is that this will be a good book but I didn’t expect that it will be really good. I can’t wait for the hard copy of this book. I will definitely buy it and read it again. I fell in love with it so much. I already suggested this book to some of my friends and tell them about the story and I even told them it made me cry and they smiled at me. So to the people reading this blog, I will also recommend this book to you. It is a must try! Thank you Lexa! For giving me a chance to read your wonderful creation. 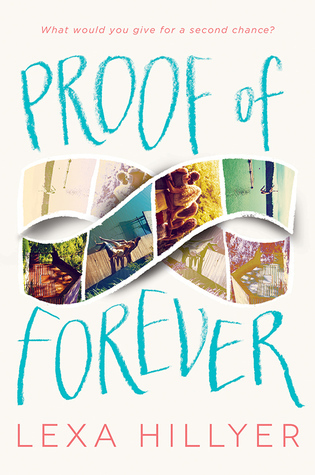 I'm the author of Proof of Forever, and the poetry collection Acquainted with the Cold, which won the 2012 Foreword Book of the Year Award's Gold Prize for Poetry. I'm also the co-founder of literary incubator Paper Lantern Lit. My poetry was anthologized in Best New Poets 2012, and appears in several journals. I live in Carroll Gardens with an extremely lovable husband and a very skinny orange tree. Follow me on instagram @ProofOfLex and twitter @Lexa_Hillyer ! 1. Tell us something about yourself, about your life as an author. I started out as a poet and for a long time I never thought I would write a novel. Now that I’ve begun writing them, I’m hooked! 2. What inspires you to write this book? I wanted to tell a lush and heartbreaking story about getting a second chance to find yourself (Yes, I knew it was going to be a tear-jerker from the start!) I had just just returned from my mother’s cabin on a lake in New Hampshire—which used to be a girls’ camp—when I began writing. So I decided that was the perfect setting for the book. 3. Do you ever feel afraid how people will react on your book? Of course! I think especially because this book takes an unexpected turn toward the end, I’m hoping readers understand why I wrote it the way I did. 4. Tell us something about your happy moments or experience while writing this book. I wrote the first 80 pages in a magical ten-day spree in July 2013. It was the height of summer and I felt extremely moved and inspired. 5. Have you ever think of going back to the past and change things? Like Joy, if I could rewind time to my teen years, I would be less afraid. I’d leap into things. The fear of failing, of falling (in love, from grace, away from myself)… these things used to hold me back. Sometimes they still do. It’s easy to say “YOLO” and it’s a lot harder to actually live as though this could be your last chance. I would love to write poems more like D. Nurkse. Grilled cheese. Really fresh, ripe tomatoes. 4. Name a place where you love to read. 5. Do you love coffee? How often do you drink? I’m a tea girl all the way! I love a mellow Oolong or on a cold morning some Earl Grey with a bit of milk is perfect. Also love Gen Mai Cha (green tea with toasted rice), and all sorts of others. Lauren Oliver turned me on to Mariage Frere’s Marco Polo tea. I love making sun tea in the summer. I have a decent collection of teacups and saucers and pretty teapots. I often drink a pot of tea a day, or when it’s warm, a few iced teas.